GE Intelligent Platforms announced the newest version of its breakthrough work process management solution Proficy Workflow, version 1.2. The new software allows operations experts to create and modify work processes much more quickly and easily without requiring support or resources from IT. With the power of work process management, companies can digitize and streamline production – from Electronic Work Instructions for Standard Operating Procedures (SOPs) and corrective action to HACCP monitoring and compliance tracking. A major new Form Designer in Proficy Workflow Version 1.2 eliminates coding for display screens and forms. Now, production teams simply drag and drop in an easy-to-use graphical WYSIWYG environment to build forms and displays for manual data entry and automated entry, from barcode readers and other devices. Furthermore, the new displays are not just viewable and actionable through Proficy Workflow; they can also be an actionable part of other applications on the Proficy SOA platform. GE and third-party software can connect to the Proficy SOA platform through service providers. Users, including operators, can easily share data and displays across applications without having to switch from one application to another. 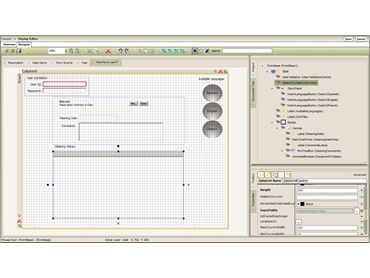 The new Form Designer in Proficy Workflow Version 1.2 also supports development of work process templates, which can be published into a library for reuse as displays and forms throughout a plant or company. By creating standard work process templates, companies can save time in deployment and reduce risk while sharing best practices globally. Templates for best practices increase consistency of work processes and reduce variation, which increases quality and decreases production costs. Proficy Workflow Version 1.2 includes an ActiveX Task List that can be used within any ActiveX container. Operators can now follow step-by-step instructions within their usual day-to-day software such as a HMI, integrating their work instructions for ease of use. This feature greatly enhances the value of a user’s existing systems by adding the power of Electronic Work Instructions to an installed application that an operator is already familiar and comfortable with, improving usability and operator performance. In addition, the new version features a Dynamic Task List (My Task List), so the production expert can control what the operator sees during the execution of the workflow. The Task List has multiple panes, which can be hidden, expanded, etc. With the Dynamic Task List, companies can give focus to certain work instructions in the display to help guide the operator. Once again, this is done by the author of the workflow, which can be a production domain expert without IT technical skills. Lastly, Proficy Workflow Version 1.2 offers one-click deployment. If the user is in the plant and wants to run Proficy Workflow from a specific computer, he/she can go to a URL and, through a web browser, automatically install the Workflow Task List on that computer. The system will automatically maintain the most current version– so there is no additional administration. This feature greatly speeds installation and deployment, making it easy to add users, and reduces system administration and maintenance.